A difference of 20 years in these shots. The first was taken by my father on a cool January at sunset. Can't see much given Kodachrome wasn't very forgiving in low light but there is enough here to be interesting. 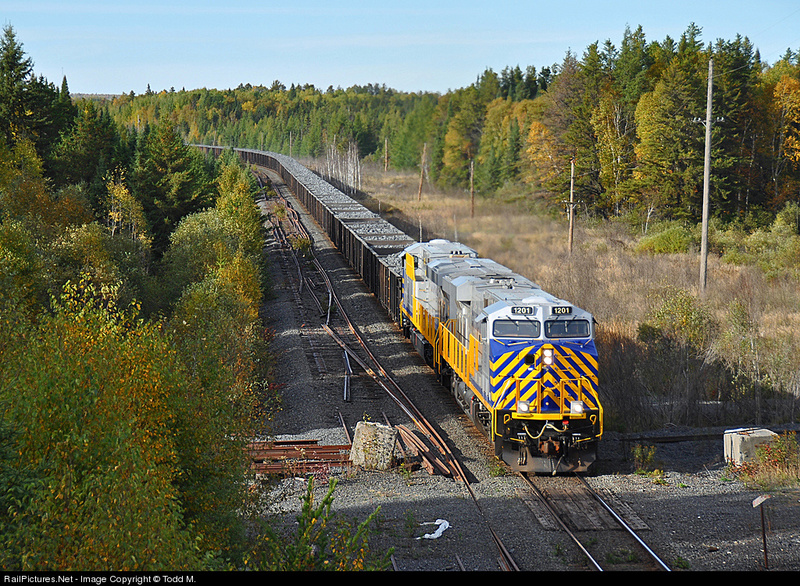 On the same day I caught the loads, a pair of UP SD40-2s roll an empty Geneva all-rail down the connecting track at Saunders. BN's tower is in the distance, complete with Cascade Green logo. 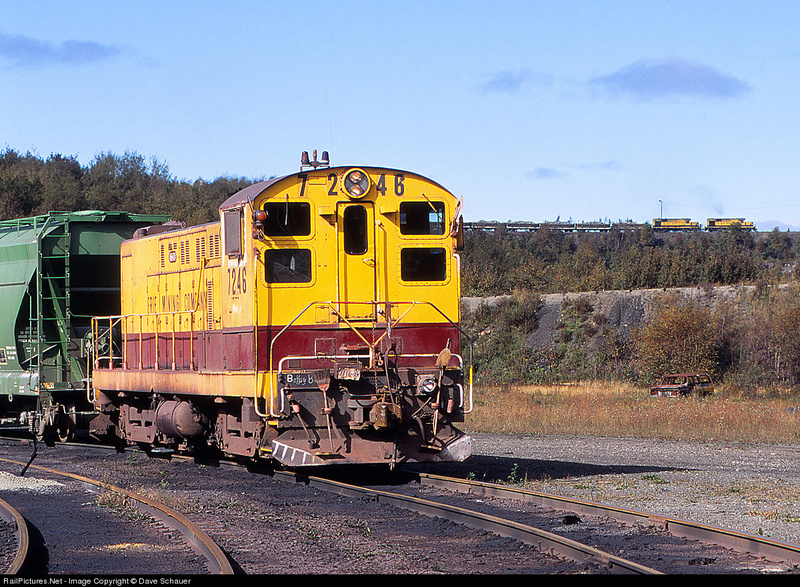 Note the "big" UP style ore cars mixed in with steel coal hoppers. Not your traditional Flashback but still a bit of historical flair. It is hard to believe that we are fast approaching the 20thanniversary of the formation of Burlington Northern Santa Fe corporation (the company was formed in September 1995 but the two railroads weren’t officially merged until 1996). It seems like only yesterday that the two roads agreed to combine. With the Twin Ports being a major player during the Burlington Northern years the memory of that fallen flag will live on for quite some time (as I’m sure the Santa Fe will in its former territory and beyond). Assisting in the remembrance is the large number of BN (and ATSF) freight cars still roaming the rails and also quite a few locomotives wearing Cascade Green. 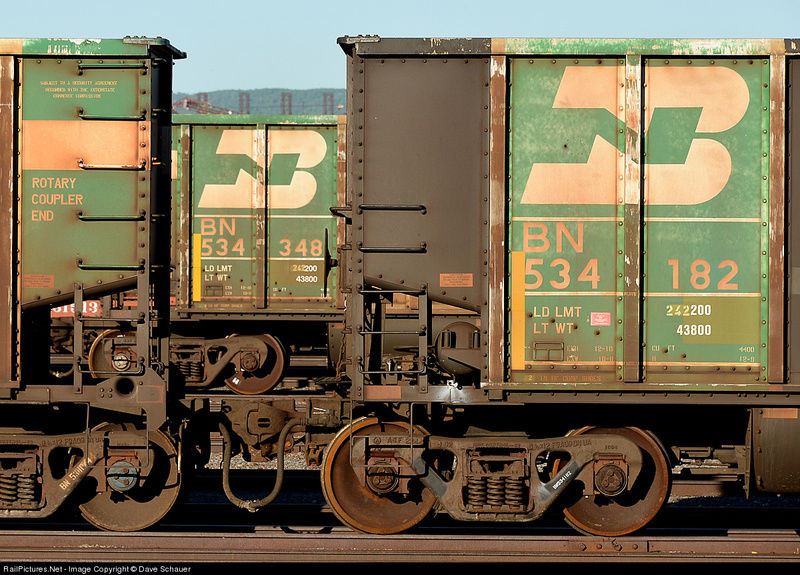 In Duluth there are a number of neat BN coal hoppers currently stored at Rices Point and I played with some different angles to capture the BN logos. 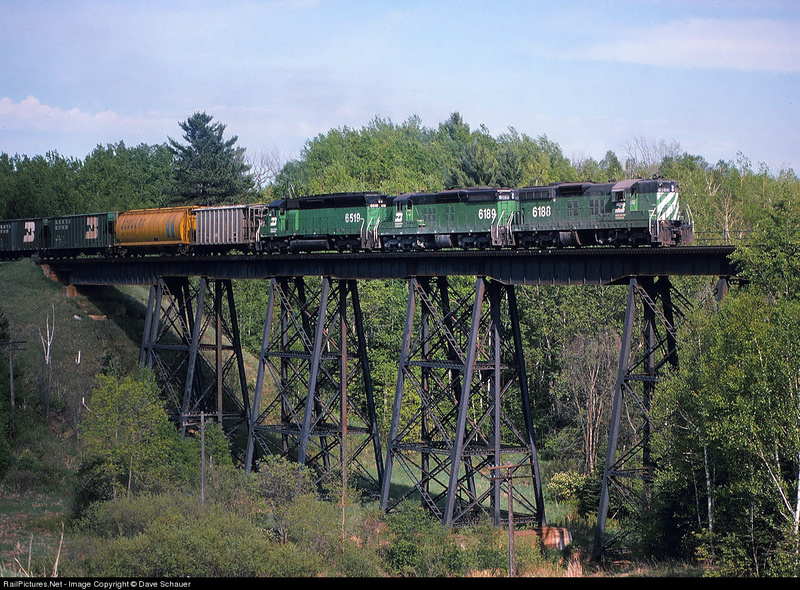 Previously I shared a flashback of the bridge at Holyoke, MN with an ore train. Here is a freight version taken in 1985. The SD9/SD45 combo is neat. Here is a shot of them from this past Sunday as they have just left the mine yard and are about to pass under the former Erie Mining Co. Dunka overpass. Very quiet out there. No DPU on the train and the two units up front. While NSM begins a four month test of GEs this week it is fun to look back to the late 1990s when NSM was shopping for newer power and borrowed a trio of GEs from LTCSMC. In this case they didn’t test the newest GEs on the market but rather a trio of rebuilt ex-ATSF U30Cs that sister railroad LTVSMC was leasing for road trains. They didn’t last long on NSM (a couple of weeks) but I was able to catch them a few different times. Here the trio rolls through Toimi with 150 loads headed for SB. 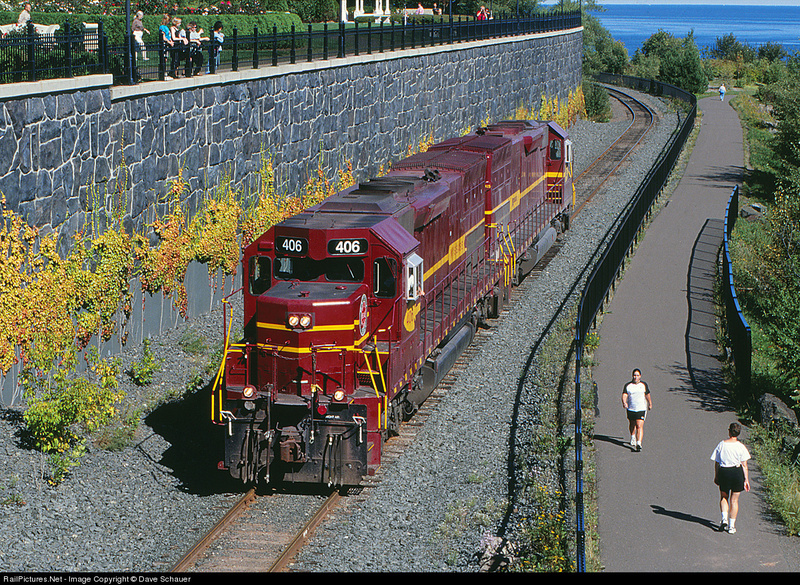 Two track related events in September and October 1999 forced the Missabe to exercise its trackage rights over the NSSR and operate a handful of commercial (freight) moves along the Lakefront Line. The first was when bridge work on the “ramp” at Missabe Junction called for the Missabe to run a pair of units from Two Harbors to the Junction and Rice’s Point to pick up Soo/BNSF interchange. Here two light units roll past the Rose Garden with the vines changing color. You can just pick out a hint of the roses at the top of the shot. They would pick up seven cars to bring back to Two Harbors. Todd’s fine shot of cold and drained 7222 had me reminiscing of the handful of trips I made into the plant before the end of operations (thanks Doug). This shot shows a mine haul train with two RS-11s heading for the crusher while a Baldwin pulls Missabe interchange traffic. I liked all the “tools” and scribbles on the front of the Baldwin, and check out that marker light! What’s the deal with a single ditch light?